Bishopdale is situated just under 3kms from Nelson, and approx. 3.5kms from Stoke. Popular due to its close distance to town, the suburb is also close to Nelson Hospital and Nelson Boys College. Bishopdale is a middle class suburb and the area is dominated by the Bishopdale Hill. There is a newer subdivision around the Bishopdale Ave area, over on the elevated south eastern slopes, but the majority of homes in the area are quite established. At the Northern end of the suburb, on the Main Road intersection of Waimea Rd and Tukuka St, there is a local dairy, fish & chip shop and a hairdresser. Nelson’s main bus route runs down Waimea Rd right through the middle of this suburb. There are regular services to Nelson, Stoke and Richmond. This is supplemented by “The Bus” which also travels along a nearby route encompassing Tipahi St and Kawai Street Sth. 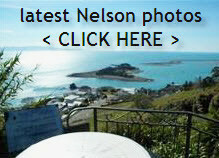 Less than a five minute drive away in Nelson you have a wonderful choice of restaurants, sure to please all tastes. We have nearly 50 restaurants in Nelson-Tahuna-Stoke. From Indian, Turkish, Thai, Chinese, Japanese, Italian, Greek, Mexican, Brewery Cafes, specialist seafood, pizzerias, NZ & Australian fare, Hotel dining, cafes and the usual fast food outlets, there certainly is something for everyone. If you drive another 10 minutes to Richmond there’s another dozen or so establishments to choose from. WEBCAM IMAGE – via www.takeabreak.co.nz site here – the view depicted on this webcam is the outlook from the newer sub-division area looking towards north. Just off to the left of centre photo is a large multi story bldg, thats Nelson Hospital.